Musical Fun for All Ages! 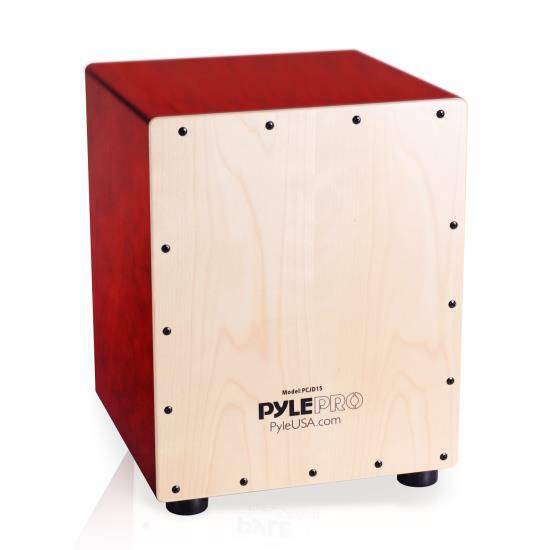 The Pyle Snare-Style Cajon Wooden Percussion Box - Cajon Percussion Box with Internal Snares - Snare-Style Cajon Produces Deep & Rounded Bass Tones - Hand-Crafted Birch Wood Panel Housing - Upper Corners Give Classic Cajon Slap & Crackle Sounds - Rubber-Capped Feet for Anti-Vibration Interference - Lightweight & Compact Design - Rugged & Durable Construction - Musical Fun for All Ages! - Technical Specs: - Housing Panel Construction Material: Birch Wood - Playing Surface Thickness: 3.2mm - Number of Snares: (2) Single Sets - Sound Hole Diameter: 4.3’’ -inches - Total Cajon Size (L x W x H): 12.0’’ x 12.0’’ x 15.0’’ -inches.